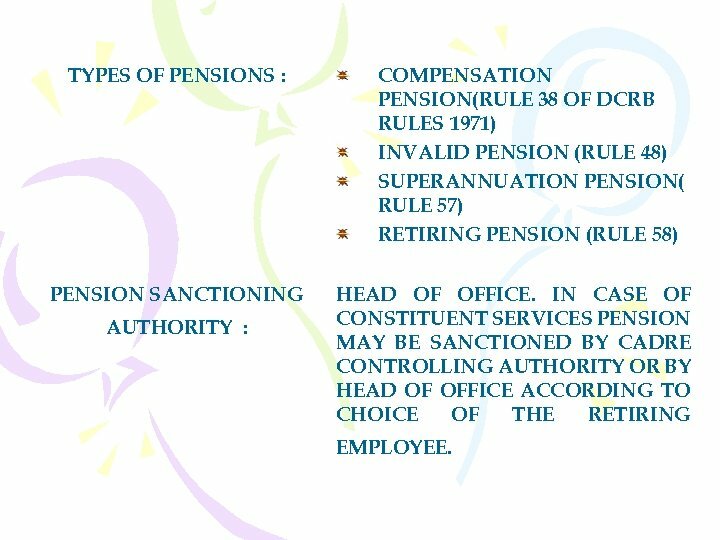 TYPES OF PENSIONS : PENSION SANCTIONING AUTHORITY : COMPENSATION PENSION(RULE 38 OF DCRB RULES 1971) INVALID PENSION (RULE 48) SUPERANNUATION PENSION( RULE 57) RETIRING PENSION (RULE 58) HEAD OF OFFICE. 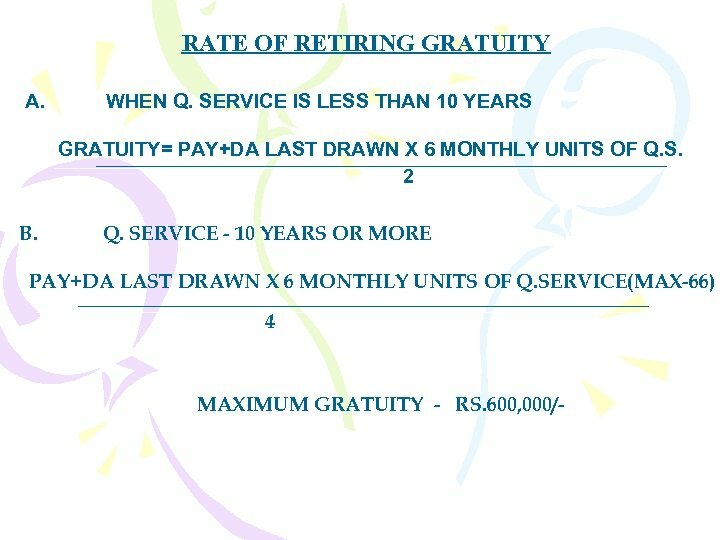 IN CASE OF CONSTITUENT SERVICES PENSION MAY BE SANCTIONED BY CADRE CONTROLLING AUTHORITY OR BY HEAD OF OFFICE ACCORDING TO CHOICE OF THE RETIRING EMPLOYEE. 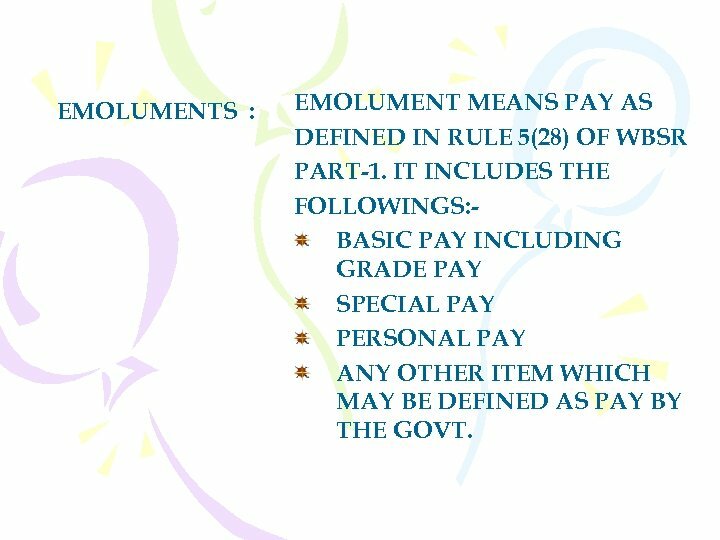 EMOLUMENTS : EMOLUMENT MEANS PAY AS DEFINED IN RULE 5(28) OF WBSR PART-1. 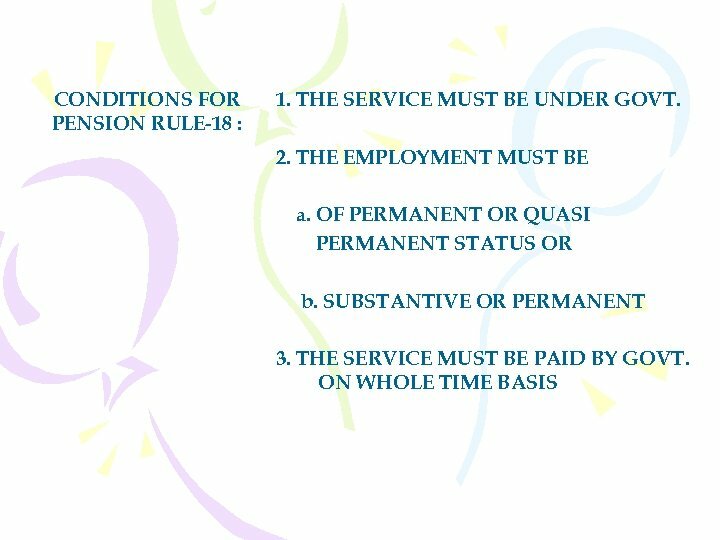 IT INCLUDES THE FOLLOWINGS: BASIC PAY INCLUDING GRADE PAY SPECIAL PAY PERSONAL PAY ANY OTHER ITEM WHICH MAY BE DEFINED AS PAY BY THE GOVT. 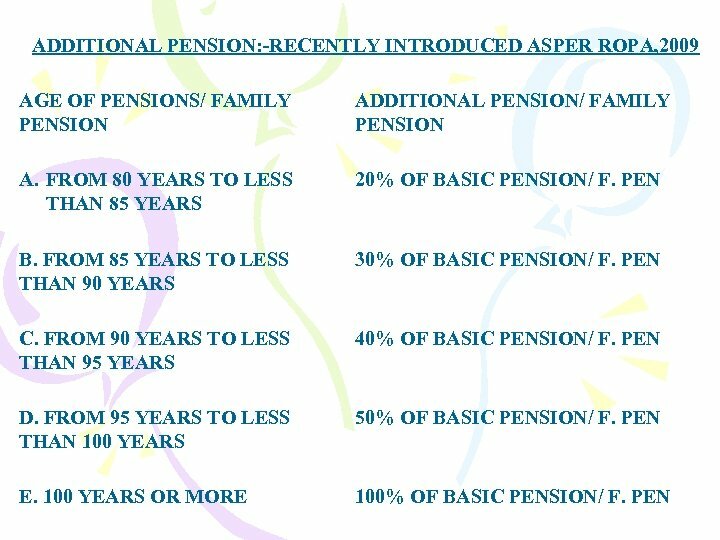 RATE OF PENSION : 50% OF LAST PAY X 6 MONTHLY UNITS OF Q. 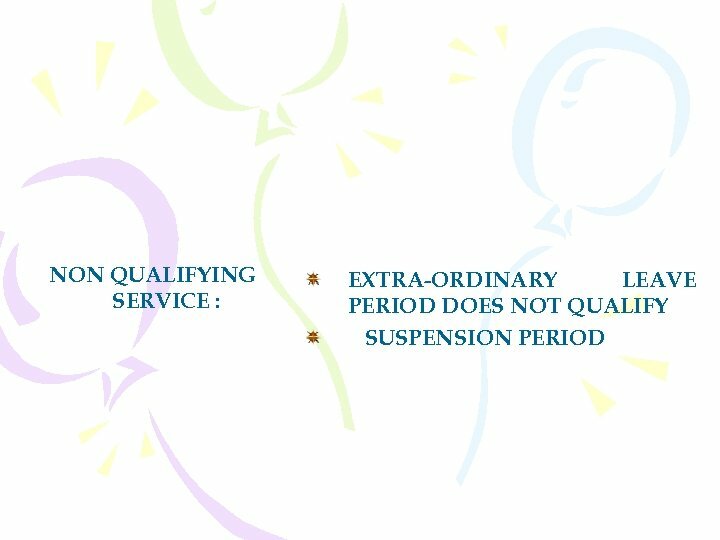 SERVICE (MAX. 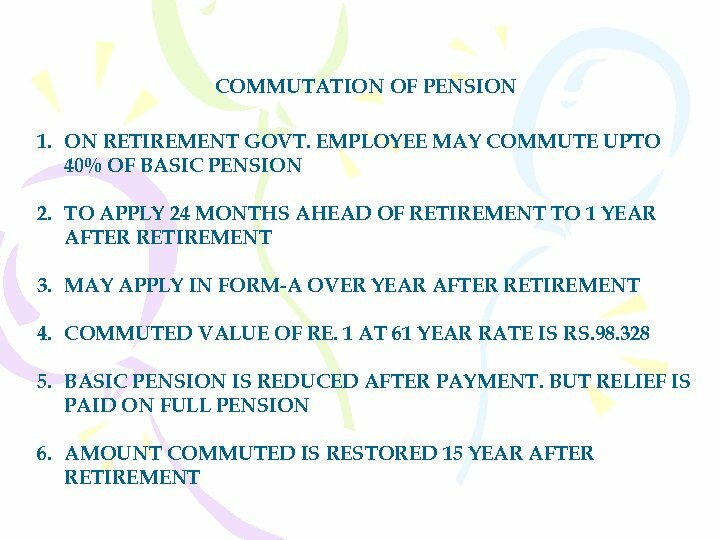 40) 40 40 MINIMUM BASIC PENSION-RS. 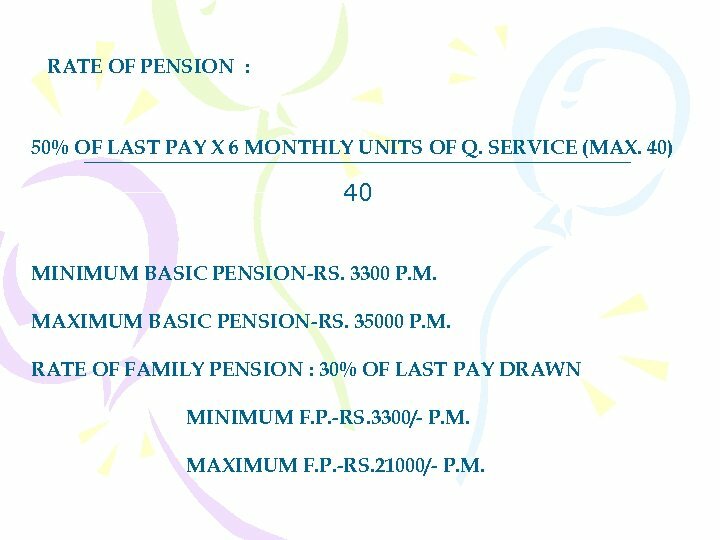 3300 P. M. MAXIMUM BASIC PENSION-RS. 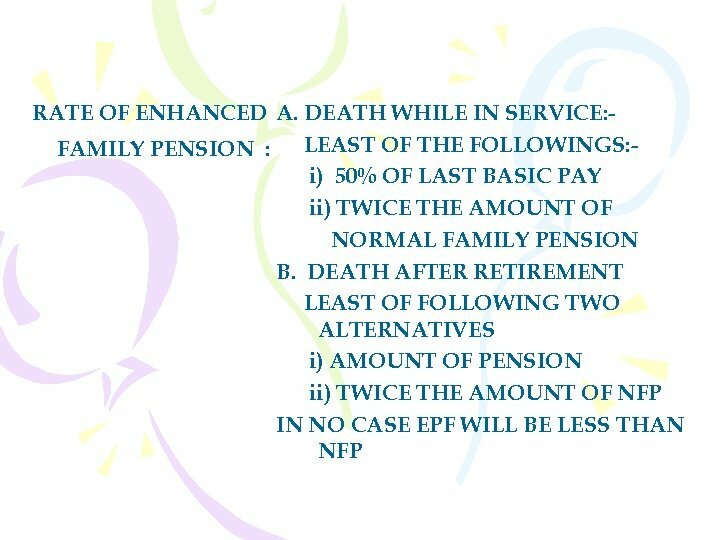 35000 P. M. RATE OF FAMILY PENSION : 30% OF LAST PAY DRAWN MINIMUM F. P. -RS. 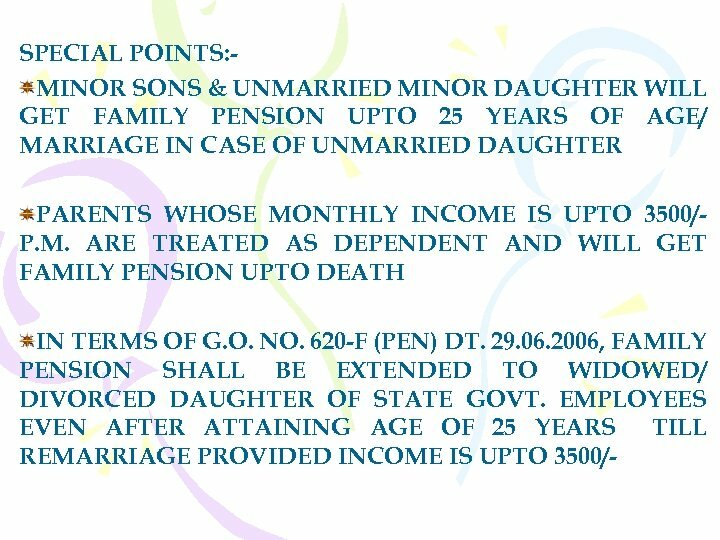 3300/- P. M. MAXIMUM F. P. -RS. 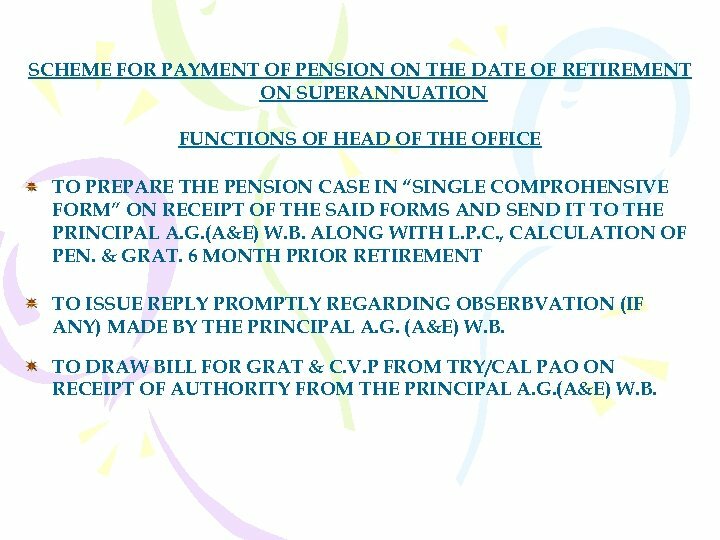 21000/- P. M.
SCHEME FOR PAYMENT OF PENSION ON THE DATE OF RETIREMENT ON SUPERANNUATION FUNCTIONS OF HEAD OF THE OFFICE TO PREPARE THE PENSION CASE IN “SINGLE COMPROHENSIVE FORM” ON RECEIPT OF THE SAID FORMS AND SEND IT TO THE PRINCIPAL A. G. (A&E) W. B. 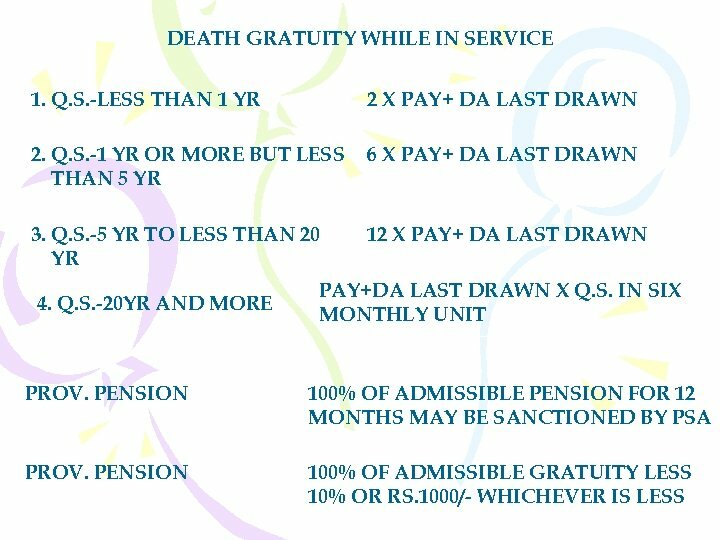 ALONG WITH L. P. C. , CALCULATION OF PEN. & GRAT. 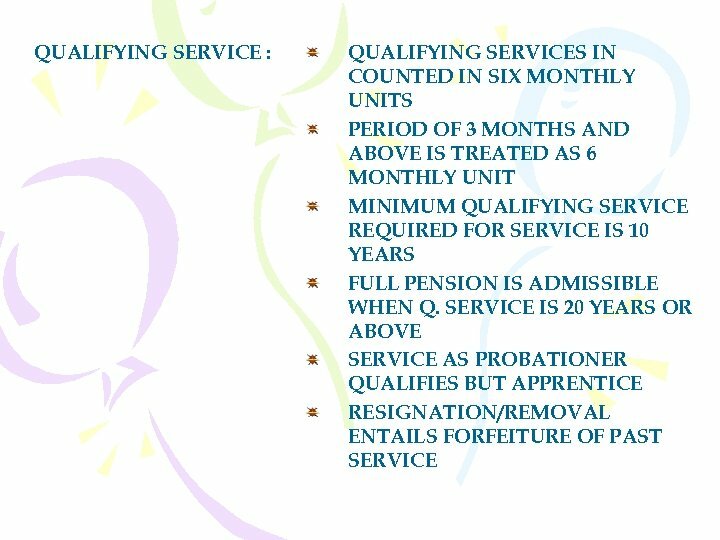 6 MONTH PRIOR RETIREMENT TO ISSUE REPLY PROMPTLY REGARDING OBSERBVATION (IF ANY) MADE BY THE PRINCIPAL A. G. (A&E) W. B. 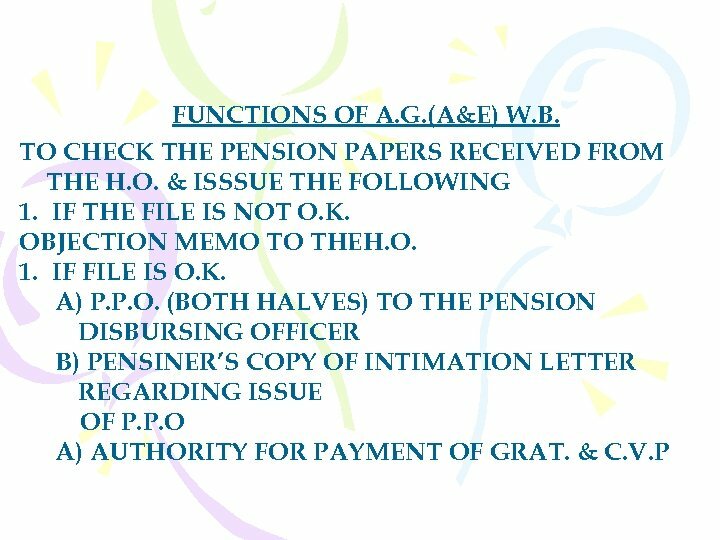 TO DRAW BILL FOR GRAT & C. V. P FROM TRY/CAL PAO ON RECEIPT OF AUTHORITY FROM THE PRINCIPAL A. G. (A&E) W. B. 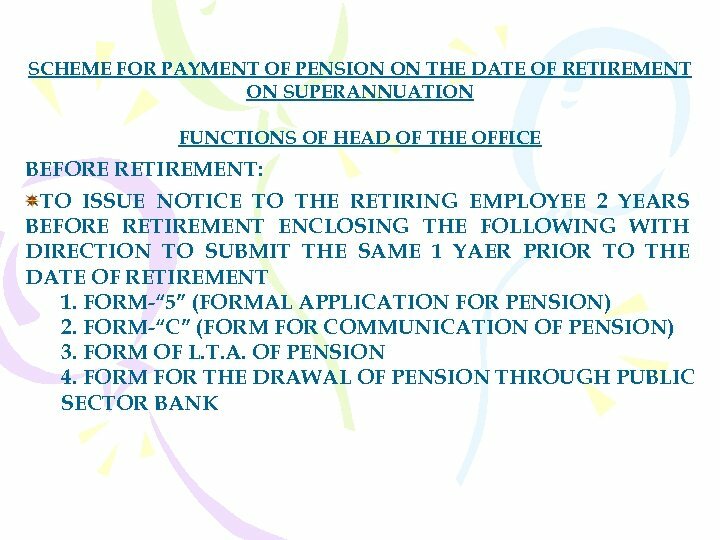 ON THE DATE OF RETIREMENT TO HANDOVER THE FOLLOWING TO THE RETIRING GOVT. EMPLOYEE 1. CHEEQUES FOR GRAT. 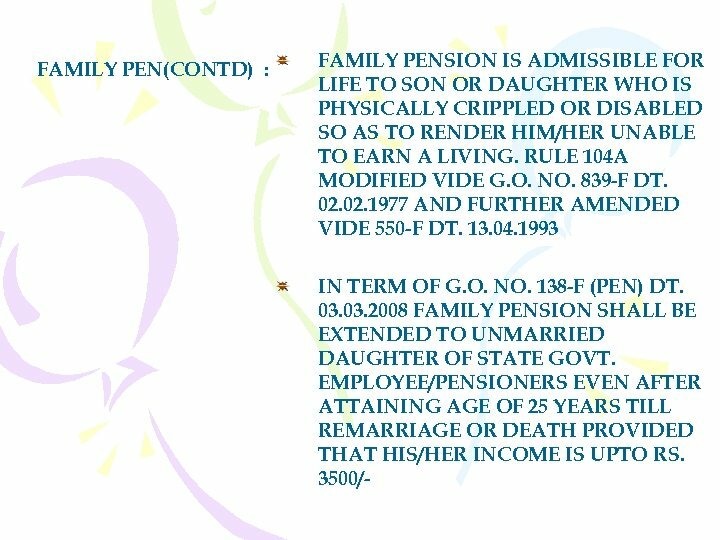 & C. V. P. 2. 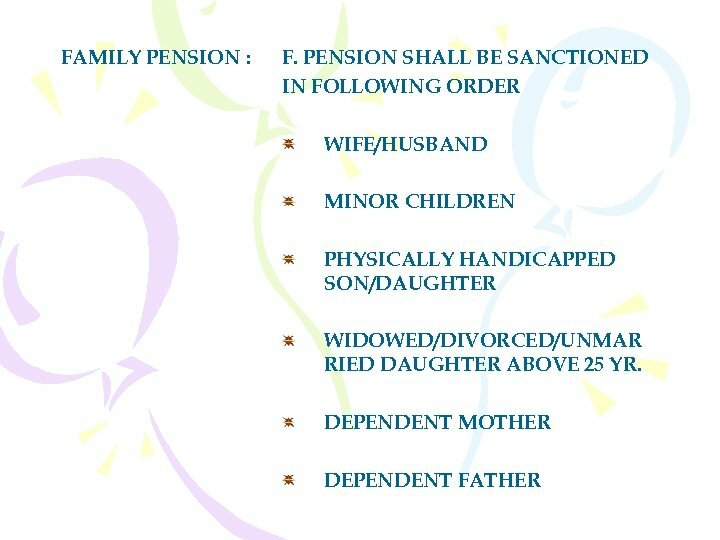 A CERTIFICATE TO THE EFFFECT THAT NO PROVISIONAL PENSION HAS BEEN AUTHORISED 3. 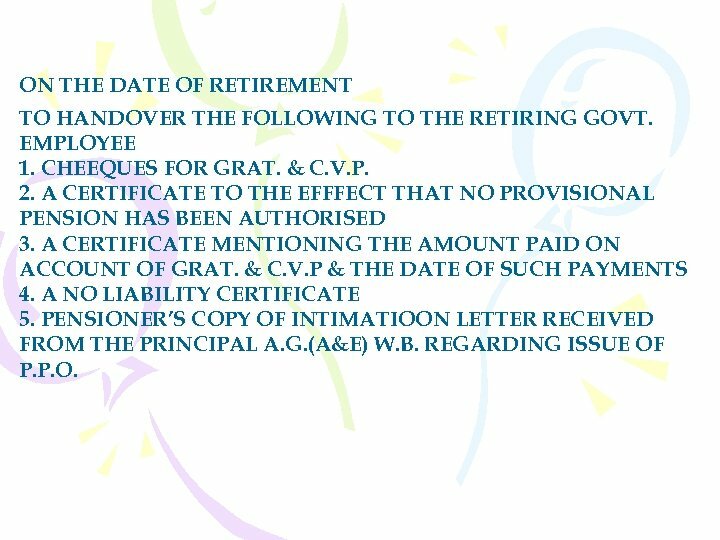 A CERTIFICATE MENTIONING THE AMOUNT PAID ON ACCOUNT OF GRAT. 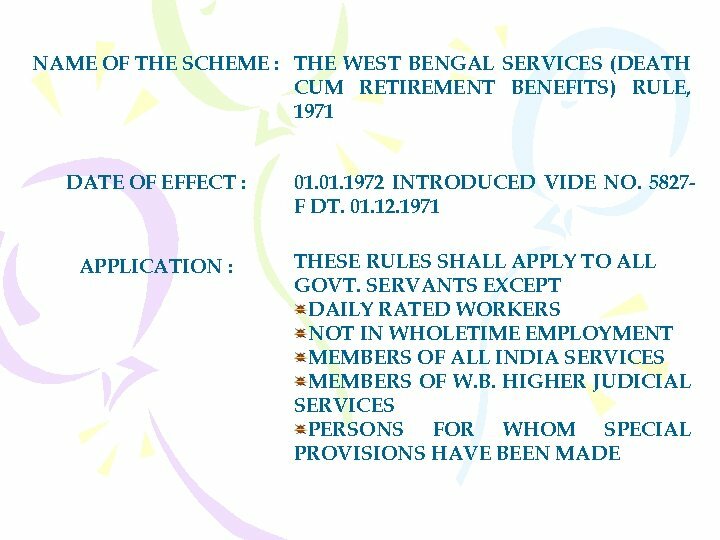 & C. V. P & THE DATE OF SUCH PAYMENTS 4. 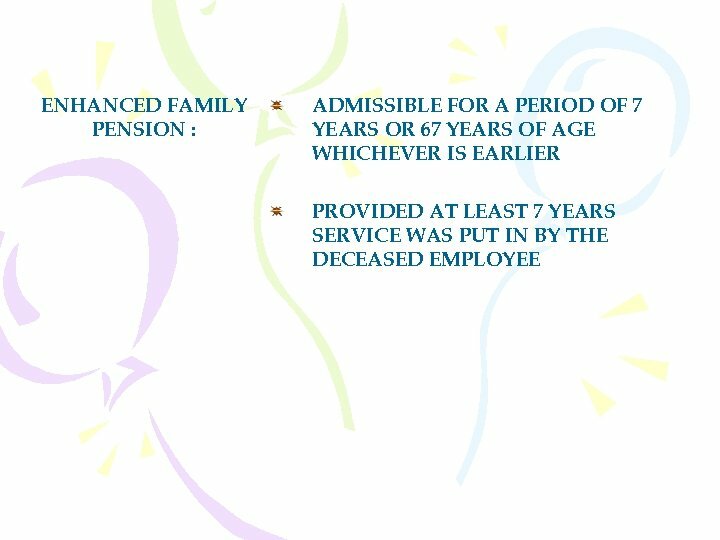 A NO LIABILITY CERTIFICATE 5. PENSIONER’S COPY OF INTIMATIOON LETTER RECEIVED FROM THE PRINCIPAL A. G. (A&E) W. B. 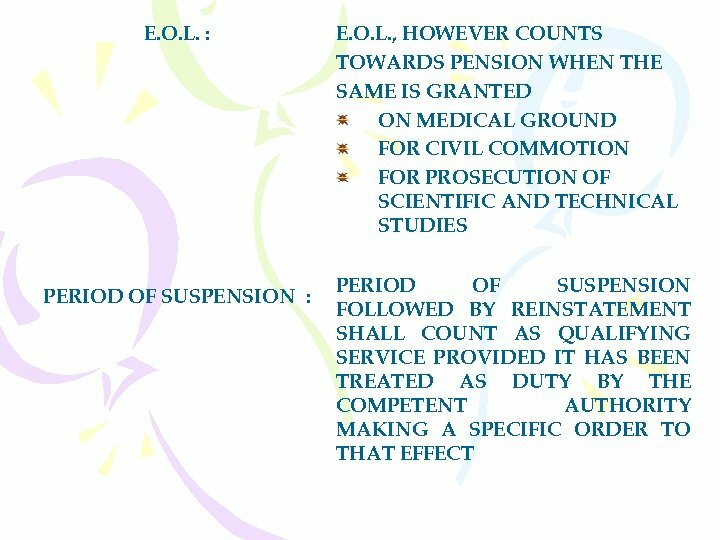 REGARDING ISSUE OF P. P. O. 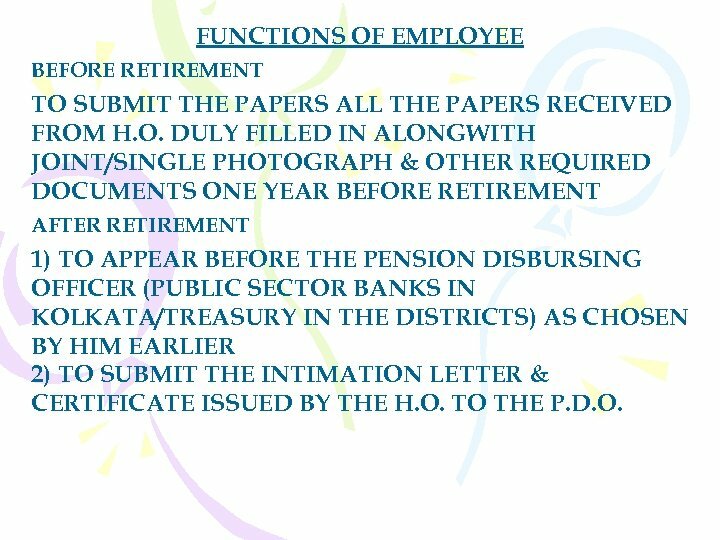 FUNCTIONS OF EMPLOYEE BEFORE RETIREMENT TO SUBMIT THE PAPERS ALL THE PAPERS RECEIVED FROM H. O. DULY FILLED IN ALONGWITH JOINT/SINGLE PHOTOGRAPH & OTHER REQUIRED DOCUMENTS ONE YEAR BEFORE RETIREMENT AFTER RETIREMENT 1) TO APPEAR BEFORE THE PENSION DISBURSING OFFICER (PUBLIC SECTOR BANKS IN KOLKATA/TREASURY IN THE DISTRICTS) AS CHOSEN BY HIM EARLIER 2) TO SUBMIT THE INTIMATION LETTER & CERTIFICATE ISSUED BY THE H. O. 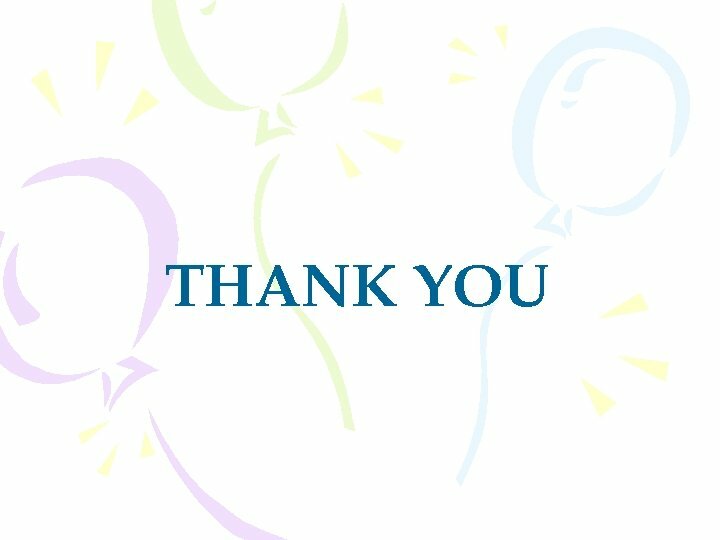 TO THE P. D. O. 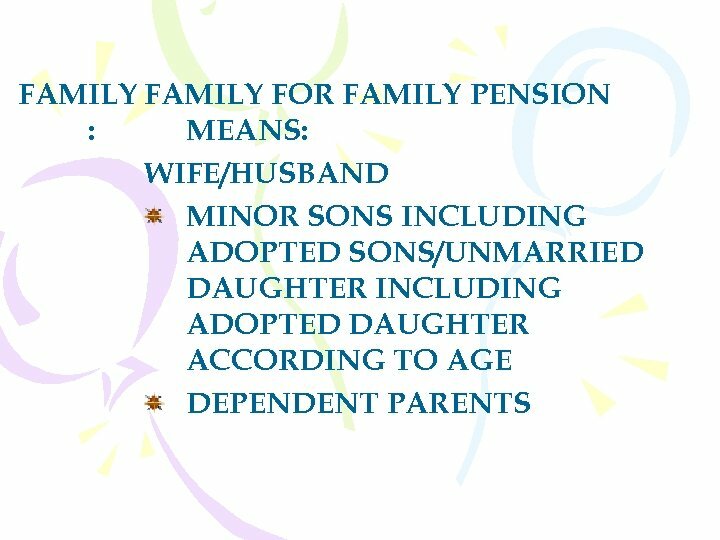 FUNCTIONS OF FAMILY PENSIONER 1) TO APPLY TO THE H. O. 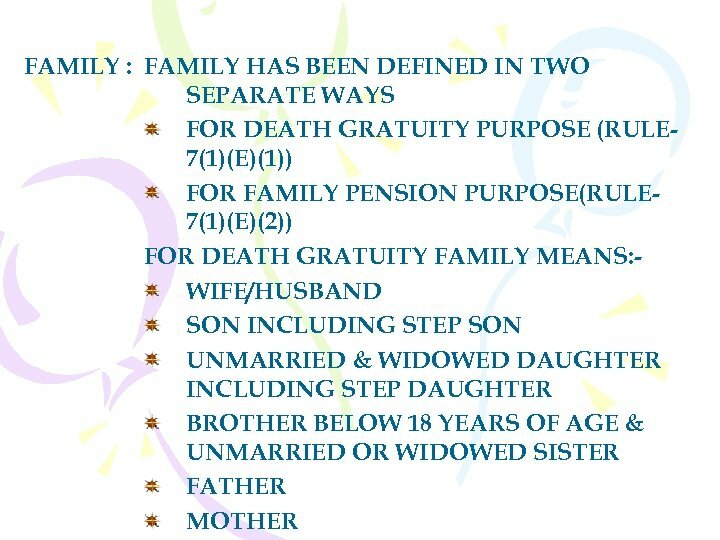 ALONG WITH CERTIFICATE OF DEATH OF THE GOVT. 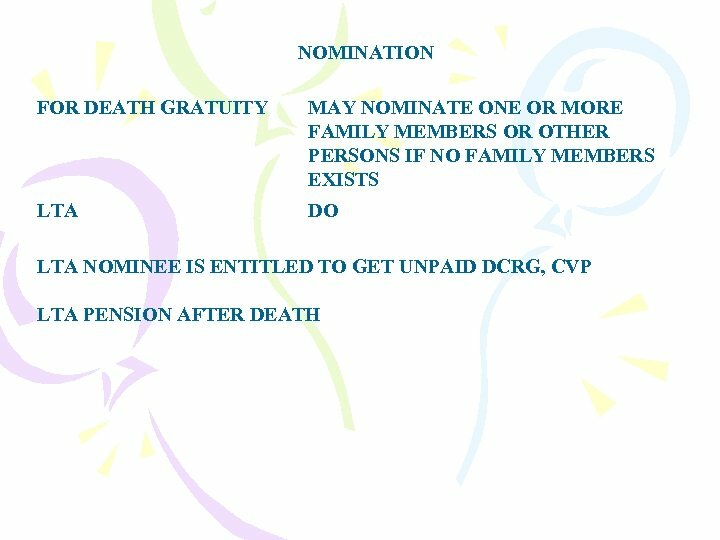 EMPLOYEE FOR SANCTION OF FAMILY PENSION & DEATH GRATUITY 2) TO APPEAR BEFORE THE P. D. O. 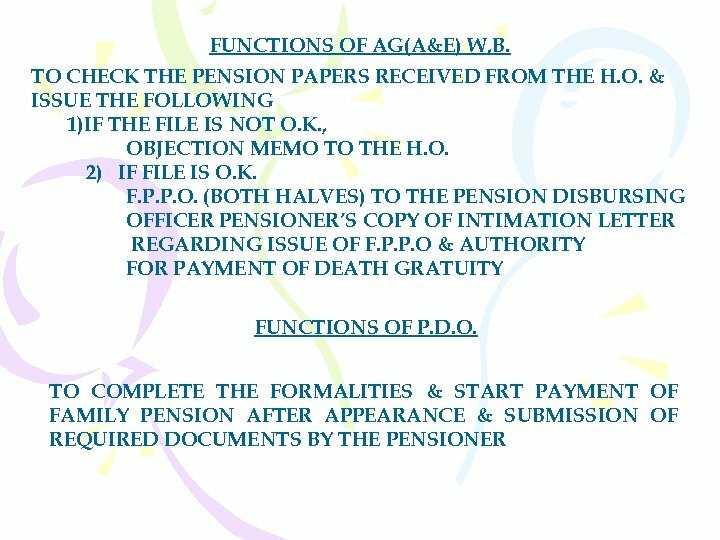 AFTER RECEIPT OF REQUIRED PAPERS FOR FAMILY PENSION FROM THE PRINCIPAL A. G. (A&E) W. B. 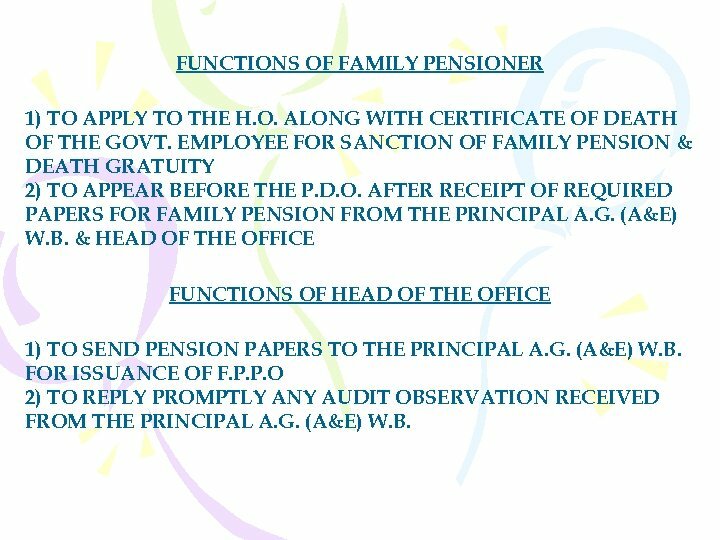 & HEAD OF THE OFFICE FUNCTIONS OF HEAD OF THE OFFICE 1) TO SEND PENSION PAPERS TO THE PRINCIPAL A. G. (A&E) W. B. 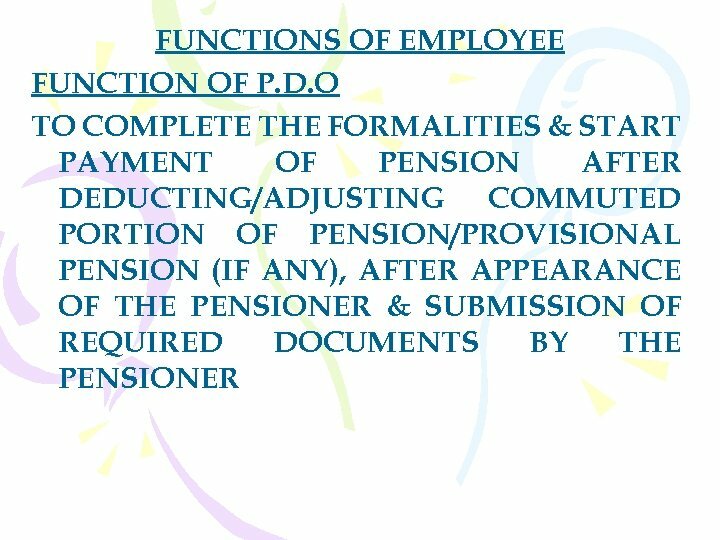 FOR ISSUANCE OF F. P. P. O 2) TO REPLY PROMPTLY ANY AUDIT OBSERVATION RECEIVED FROM THE PRINCIPAL A. G. (A&E) W. B.